How Hard Do Most Fastpitch Softball Players Throw? Home Softball How Hard Do Most Fastpitch Softball Players Throw? In this article, we will discuss how hard most fastpitch softball players throw. You’ll see an example of a very hard thrower and learn the common throwing velocity ranges across multiple ages. How Hard Should a Softball Player Be Throwing? The young lady below throws up to 70mph, averaging high-60s speeds. This is INCREDIBLE and not normal for any age, really (especially not for age 14, as she is in the video). Alright, so if 67-70mph is very, very fast, then what is normal? NOTE: The following velocities are for travel-level players who are serious about softball. To include casual player and recreational players would skew averages too much. It’s safe to assume that recreational players will throw 3+ mph slower than the speeds shown below. As a throwing coach, it’s my goal that every player reaches at least 55+mph by her junior year in high school. This is attainable if a player puts in consistent work. BUT…my goal for every player is 60mph or more. When a softball player begins high school, the game speeds up dramatically. What this means is that players are all faster, beating out ground balls and turning more singles into doubles, scoring more often on singles from second base. Base stealers are better, and every position on the field requires more arm strength. It’s time to get serious. At this age, most players are still barely breaking 50mph if they haven’t devoted significant time and effort to throwing instruction and/or strength training. This is where players with naturally good arms separate themselves significantly from the pack. Most players I work with throw in the mid-40s at this age and need a lot of help. Fortunately, the game is also very slow and so many can still get by with loopy throws. But this will change drastically at 14U. Why Do Some Softball Players Throw Harder Than Others? Other genetic factors like fast-twitch muscle fiber composition, etc. Check out the video below for one of my go-to throwing drills for softball players. It’s called the Lawnmower drill and it’s really simple and effective. Also, be sure to subscribe to my YouTube channel, where I release new videos every single week. Look for the subscribe button at the end or click here. Make a change today. 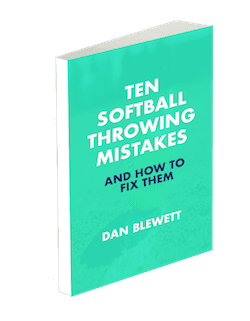 Download my free Softball Throwing eBook. In it you’ll learn common mistakes and how to fix them. 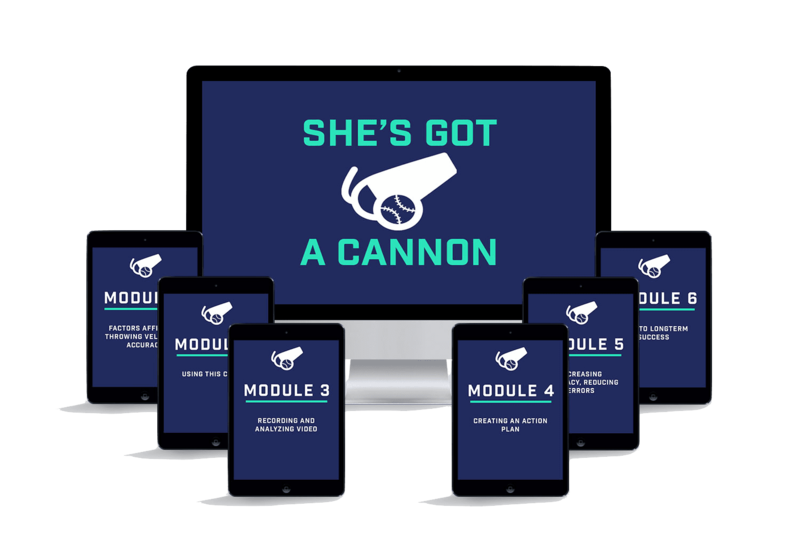 I also offer two extensive online courses on throwing that will walk coaches, parents and players through a step-by-step plan. Did this article help? Leave me a comment below!